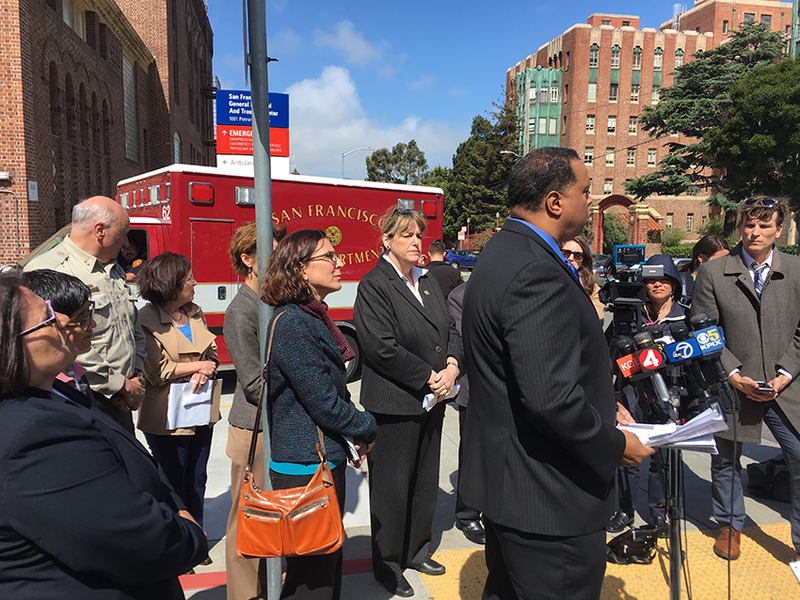 From left: Hospital spokesperson Rachel Kagan, Sheriff Vicki Hennessy and Director of San Francisco Health Network Roland Pickens in joint press conference at San Francisco General Hospital on May 31, 2018 to address the death of Ruby Andersen on their campus. Photo by Mallory Newman. The 75-year-old woman found dead at San Francisco General Hospital had been missing for ten days before an engineer found her in a stairwell of a power plant building, hospital authorities said Thursday at a press conference. This is the second time in five years that someone from the SFGH campus has been found dead in a stairwell. SFGH lost a patient, 57-year-old Lynne Spalding, in 2013, who was found dead in a stairwell 17 days later. The city paid a $3 million settlement to her family. That incident provoked a change in the hospital’s protocol for missing patients that requires a code-green search, meaning the entire campus, including surrounding facilities, would have been searched. In Wednesday’s incident, however, Ruby Andersen was a resident of a Behavioral Health Center on the hospital campus, but not technically a patient. That distinction meant there was no search for her. When reporters pressed Rachel Kagan, spokeswoman for the San Francisco Department of Public Health, on the lack of a thorough search, she said that now that a loophole had been found, they are taking immediate steps to address it. Andersen checked out of her Department of Health-run facility on May 19 at 9 a.m. but didn’t return at 4 p.m. as she had indicated she would. She was reported missing on May 20th at 1 p.m. to the Sheriff’s Department, which patrols the hospital grounds. The Sheriff’s department then contacted the family, checked to see if she had been admitted to the hospital or into jail, and spoke with the medical examiner. Andersen’s information was entered into the statewide missing and unidentified persons system and a missing persons flyer was circulated. All the while, she may very well have been on campus grounds. Once Andersen’s body was found Wednesday, Kagan said she was unaware of any missing patients. However, at that time, officials hadn’t yet checked with the other facilities on the SFGH campus, prompting questions about communication between hospital facilities in these situations. Soon after, the body was identified as the missing person who had been reported to the Sheriff ten days earlier. Contrary to earlier reports, Director of San Francisco Health Network Roland Pickens says the stairwell where Andersen was found was not locked, but could be freely accessed on two levels of the building from 6 a.m. to 6 p.m. Monday through Friday. Outside of those hours, access could only be gained with a security badge. It was kept open, he said, because of the high volume of materials, vendors, and staff that passed through the building. Apparently, few were going through the stairwell and, in the end, it was an engineer who discovered her body. Since the incident, 24/7 security badge access to the building has been reinstated. The power plant housed turbine engines for emergency access to power. Sheriffs don’t regularly patrol such buildings by agreement. They do patrol the interior of buildings where patients are and parking lots. Sheriff Vicki Hennessy confirmed that if Andersen was a patient instead of a resident, the stairwell would have been searched. The medical examiner is in the process of conducting an autopsy and more information will be announced tomorrow, June 1, at 10 a.m. The family has not given permission to release other medical information. Security camera footage is also being reviewed to see if more information about Andersen’s death can be revealed. An ongoing investigation is underway by the Sheriff’s Department, SFPD and Department of Public Health.